Hiya, friends! Digging into the continuation of last week’s part 1 post, here are the final 3 lifestyle changes flight attendants make when. Ask any senior mama flight attendant what has been the worst part of their job, and the answer may surprise you. Unruly passengers? Piece of cake. Being stranded in a snowstorm? Meh, it happens. But, reserve? For many flight attendants, especially at the regional level, reserve is the worst part of this job. 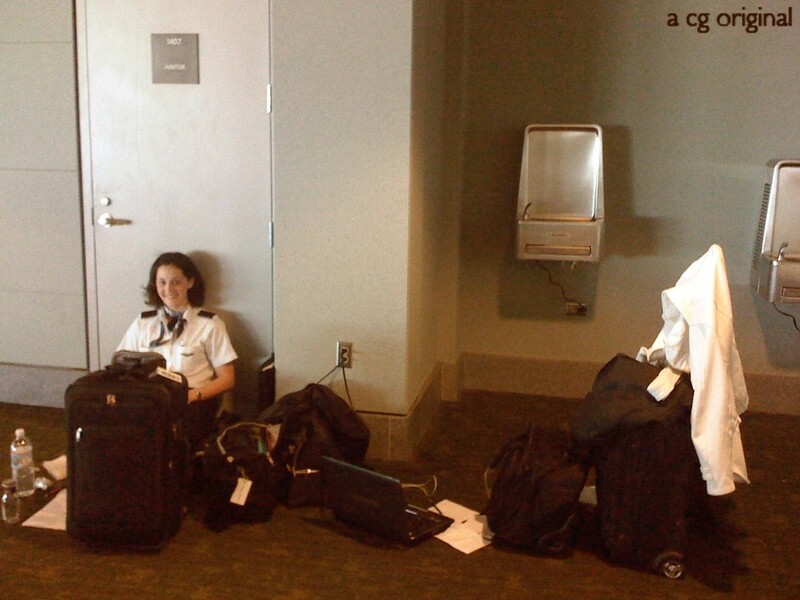 My friend Val, whom I met during training, and I sitting hot reserve at Denver International Airport in Jan 2010. I spent the ten hour shift looking for crashpad in Denver. As a reserve you get the least amount of time off, have no idea where you might be flying this month (if you fly at all), and you are paid less than line holders (those flight attendants senior enough to hold a schedule and know what flying they will do through the month). If you are lucky to work at a legacy carrier where reserve is offered on a rolling schedule like one month reserve every third month, for example, you might be able to keep your sanity, but not all carriers are created equal. At some airlines where the average age of a flight attendant is 60, reserve can last as long as 25 years (I wish I was joking). As a reserve it is your responsibility to sit on call for 12 or 24 hours depending on your airline. Sometimes you will sit hot reserve or airport standby where you can sit up to ten hours at the airport ready to go at a moment’s notice for a last minute call off or to board a flight for a late flight attendant. You think your three hour layover is rough? Try sitting three hot reserve shifts at the airport in one week (that’s THIRTY hours!). When I first started my life as a flight attendant, I was so excited to travel to all these new cities. What I didn’t realize is I would be seeing these cities from the inside of my hotel room in the middle of nowhere. Of course, I always had the option to rent a car and travel into civilization to do some exploring around the city where I was overnighting, but that’s impossible when you are on call and only have an hour and a half (some airlines are two hours) to get to the airport should you be needed to cover a flight for a flight attendant that was reassigned or called in sick. Nine times out of ten, I would never be called, but who wants to pay rental car fees to risk that one time? Your Relationships Will Inevitably Change, and You Can’t Stop It. It’s a weird dynamic, but you make “friends” quickly. Whether or not they are quality people to keep around will remain to be seen, but due to the nature of the job and the loneliness it can fester, friendships form (and burn out) quickly. It’s normal to meet someone you have never seen before and within the first ten minutes of meeting them you know their full name (middle included), their husband or wife’s name, where they live, how many kids they have, their pet’s (if they have any) names, and that they have a doctor’s appointment on this day for this medical issue they have going on (“can you please pick up my trip that day?”). A picture of some of my good college friends and me. 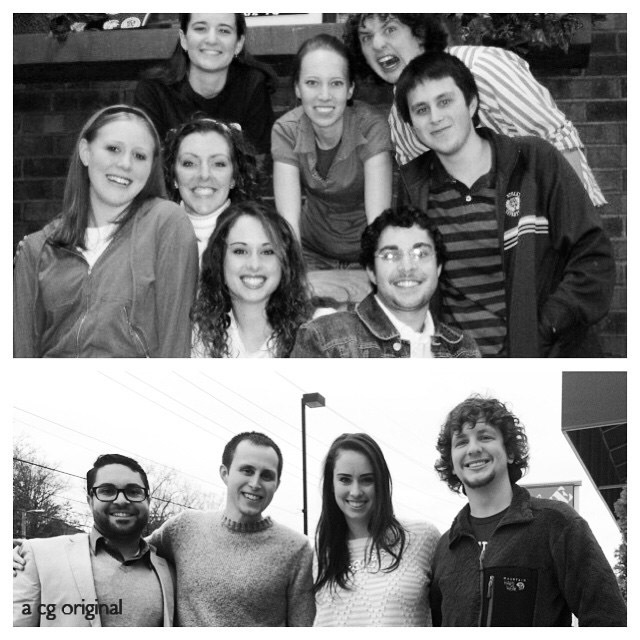 The top photo is us in college and the second photo was taken 8 years later. I truly feel those who succeed in this job start the industry with some sort of life outside of the industry. A friend base they can count on. I’m fortunate to have almost a decade long friendships to keep me grounded, but for many it’s not so easy. When you’re gone it’s the out of sight out of mind mentality. I relocated when I first started this job. Not only was I on eternal reserve with no life, I was living away from my friends in a new place where I didn’t know anyone. I’m social, and I would meet people, but forming friendships was a difficult task because I was never around. I stopped getting weekend invitations and people forgot about me. Any time I came to town I had to alert the press to my arrival, blow up Facebook newsfeed, and tweet multiple times that I had arrived to town, please please please, let’s make plans. It was a big adjustment at first, but I did find a silver lining. My friendships now are meaningful. I have people in my life not out of convenience (because this job certainly isn’t) but rather out of a true love for our friendship. Relationships are no longer one sided, and to make them work, both of us have to engage and make time for each other. While my quantity of friends have certainly dwindled, the quality of those relationships in my life have certainly grown. Everything You Know About Food Will Change. I never gained the freshman 15 in college, but boy did it catch up to me when I started flying. An entire world of food choices landed at my feet, and I inevitably gained 20 pounds my first year. I know I’m not alone (and, yes, I take comfort in this fact). As flight attendants, your scheduled is so topsy turvy. There are some days you’ll be eating breakfast at 5am and lunch at 10am while the rest of the world is still finishing what’s left of their coffee pots. Other days you might be having dinner at 10pm. And in between? You’re eating the snacks found on the plane. The aircraft is a snacker’s paradise. I wouldn’t change the experiences I’ve had, the friendships I’ve gained, or the skills I’ve learned for anything in the world. Anyone who has spent any time in an airport knows healthy food is hard to come by, and even if you are ordering a salad at McDonald’s, it’s still fast food (and McDonald’s). You’ll see many flight crews carrying “lunch boxes” around (they’re really mini coolers). Mine is big enough to provide three meals a day plus snacks for five days (an entire trip). Sometimes there just isn’t enough time to get off the plane to get food especially during a long day. I’ve had times where I’ve pulled out my my delicious three course dinner (seriously) while the other flight attendant is eating peanuts and staring longingly at my food because we didn’t have enough time to get off the plane to grab something before heading back to wherever we’re going (of course I offer to share). This job has its overwhelming days, but, at the end of the day, I wouldn’t change the experiences I’ve had, the friendships I’ve gained, or the skills I’ve learned for anything in the world. I would love to hear from fellow flight attendants if you have anything to add. Leave your thoughts below.